I am a very novice knitter trying to do a small blanket with a basic knit stitch. I am working with 100% cotton yarn and I have 16 inch bamboo needles. I cast on fine and where I am getting stuck is on the knit stitch. I do the first stitch and as I pull the loop onto the second needle I develop this slack in my piece. between the two needles that worsens with each stitch. Please see the image below, I am developing slack after the first stitch that grows with each iteration. I have just pulled the loop off my non working needle. I make my loops fairly tight as well so I do not think the slack is coming from there. After I put my working needle through the leg in the knit direction I pull the thread through and I tighten the thread going towards my yarn ball. I am beginner but this is preventing me from even getting a scrap knit together let alone a real project. On the topic of yarn and needle size, I have really long needles and made the amateur move of just grabbing a set and throwing out the wrapping so I cannot give you a diameter either. The yarn brand is Sugar 'n Cream 100% cotton, it does not list a needle size on the package. Thank you for the advice thus far... I am determined to get something going eventually. 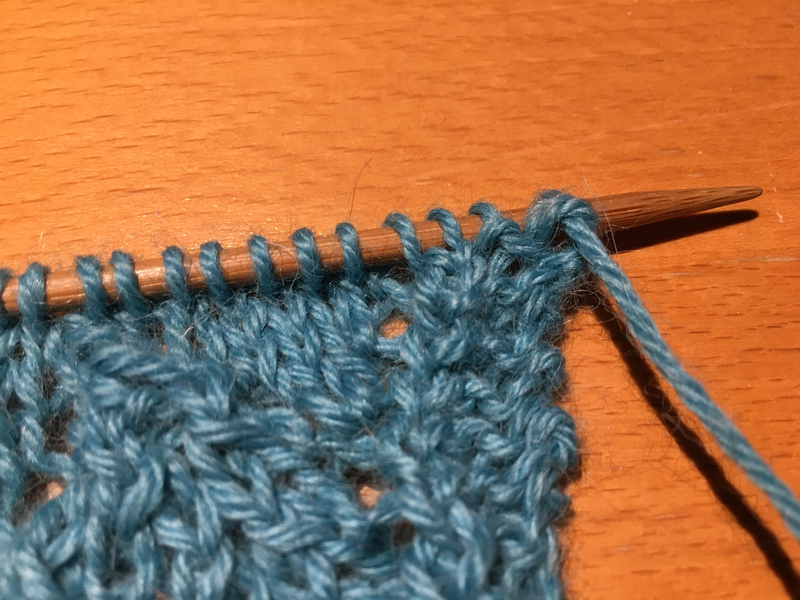 From the image you've shown it looks like you're on the first row of knitting after casting on, and it also looks like you've used a loop (a.k.a. backwards loop) cast-on method. It's common to get an ever-increasing amount of slack on the first row when using this kind of cast-on. A loop cast-on is easy to do, but hard to do well because the tension used when casting on is fiddly. If you keep knitting this piece the knit stitches will even out, but they might not even out completely. I recommend starting with a long tail cast-on. It will take a little longer to get the hang of, but you won't have the slack problem. The slack in the work between the needles will even out with the next stitch. The slack in the yarn you are using to make the new stitches should be pulled tight when you make your stitch. While your attention is on it you will find that your new stitches might look different from the one you made before. It is mostly better to knit a small piece that is not going to be used for anything before starting a proper project. In that trial piece you can make all beginners mistakes and work till your stitches are even. Then there is time to start your first real project. I agree with Belle that your yarn is not in scale with your needles. I think you will feel better if you get a thick wool or fake wool in a light or bright colour, you do not need much, the smallest amount they sell. Second hand shops, charity shops, trift shops often have some that people donated, new and with the wrapper. Get one that ask for the size of needles you have. And start with no more than 20 stitches to get to know knitting. The slack as is in your picture is what I would expect in my own knitting, in the next row I would not let it grow. But you do not make it easy on yourself with your choice of yarn and needles. What Willeke says is good advice. Also: make sure you use the right size needle. Your yarn will indicate what needle size you should use. This can either be in mm, UK sizes or US sizes. My current yarn says 7-8mm needles for example. Different people have different knitting styles. I personally like knitting tight. I will prefer the larger size in the range. Actually, I even went up to 10mm for my project, to create a more open effect. 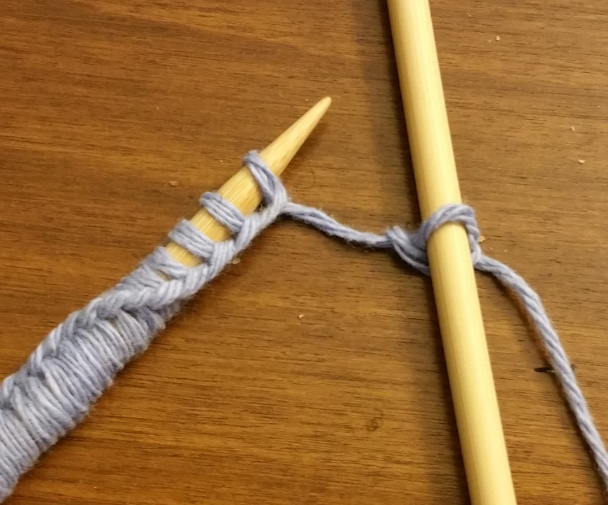 Choosing the right size needle will make your knitting feel more natural. Experiment a few rows with your needles until you feel you have the right ones. Not the answer you're looking for? Browse other questions tagged knitting yarn casting-on or ask your own question.